Some parents loathe the plethora of ‘commercial’ books available. You know the ones I mean – stories ‘created’ from the latest movie or trend. To a certain extent I loathe them too. But then I reassessed my position – any reading is good reading, especially when your child can’t wait to get their hands on the book. So, in the name of creating future readers, I present the Angry Birds: Side-Splitting Joke Book. We’ve seen those testy little red birds and peevish green pigs on everything from t-shirts to cupcakes and by all reports, the Angry Birds empire raked in a cool one hundred and six million dollars for its creator, Rovio, last year. Now we get the last laugh with the Angry Birds: Side-Splitting Joke Book. It’s a neat double-sided book packed with the kind of gags kids love to read and tell. One side stars the ever-conquering birds. Flip the book over to read jokes from their arch-nemesis, the pigs. The book sticks to its theme – there are lots of jokes about birds and pigs, as well as gags about animals in general. I suspect adults might have heard some of them before but that won’t stop kids thinking they are delivering fresh and funny material! 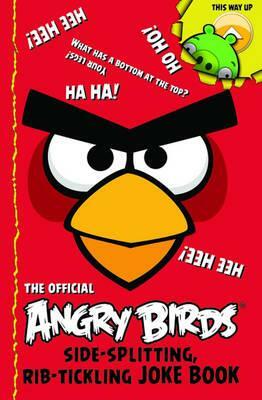 Angry Birds: Side-Splitting Joke Book is available via Book Depository which delivers free-of-charge to Australia. See more Angry Birds posts here.